Although 2012 is a year that has seen some of the most modern fashion changes to date, there has been a surprising 50s fashion come-back trend. From the tightly nipped in waists made popular by Marilyn Monroe, to the ostrich feather hats worn at high-society events, cat walks and malls everywhere are seeing a surge in 50s trends. From high street stores to higher end boutiques, shopping districts across the UK have been adorned with styles and accessories that have been heavily influenced by the 50s. While women buy dazzling jewels and figure drowning fur coats with their credit cards in designer stores, charge cards are being used to the maximum to indulge in high street dresses with big bows. One 50s fashion come-back trend that has become increasingly popular is the full skirt and bustier dress. Made popular by celebrities such as Katie Perry, the figure hugging dress is designed to accentuate the female figure, helping women make the most of their curves. Not only have clothes from the 50s era made a comeback, many of the hallmark accessories worn by women are being adopted by the fashion icons of today. As well as stockings with obvious seams being incorporated into work, casual and evening outfits, many women are now choosing to wear larger than life jewellery. For added glamour, high top lace gloves are being combined with thick heeled shoes. The 50s fashion come-back trends haven't just impacted women, men too have begun adopting styles that were made popular by their fathers and grandfathers. Recent modern trends such as bright shirts, casual shoes and loose trousers are all making way for smarter and sharper features. During the 2012 Paris fashion week, men walked down catwalks wearing tailored suits, Ivy League sweaters and waist coats. On the more casual side of things, leather jackets and Grease style quiffs were adopted. 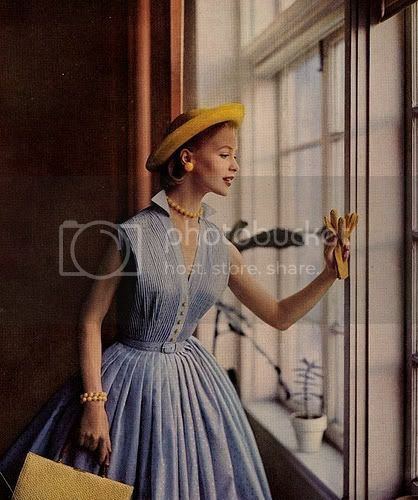 Many of the 50s fashion come back-trends can be found in local stores, and even on popular websites where you can purchase with your credit card, but for guaranteed style, making purchases in the best shopping districts is advisable. If you visit Soho and Islington, you won't just find replicas of 1950s styles, you can also dig a little deeper and unearth original items, giving your image a real 50s feel. You may even want to exercise your credit card in area like Piccadilly Circus, where you will find clothes and accessories that mix both 50s and modern styles. Finally, if you want to grab a bargain, take yourself to Portobello Market, where independent retailers will offer you great deals. hala...ang problema ani ba kay d ni pede sa akong hawak...waaaa...kadako sa akong bilbil!